With the new B63S - 700 performance kit BRABUS significantly upgrades the potential of the 5.5-liter V8 Biturbo engine in the ML 63 and GL 63. And like the familiar B63-620 performance kit, which boosts power output of the eight-cylinder to 456 kW / 620 hp (611 bhp), the new and markedly more powerful version is backed by the one-of-a-kind BRABUS Tuning Warranty of three years, up to 100.000 kilometers/62,000 miles (see BRABUS Warranty Terms and Conditions, updated July 2013). It goes without saying that this performance kit will soon also be available for the Mercedes G 63 AMG. At the heart of the BRABUS B63S - 700 engine conversion are the newly designed peripherals of the turbocharged eight-cylinder four-valve engine. While the intake and charge-air pipes immediately catch the observer's eye thanks to their BRABUS Gold Heat Reflection insulation, the other important details of the conversion remain invisible from the outside. 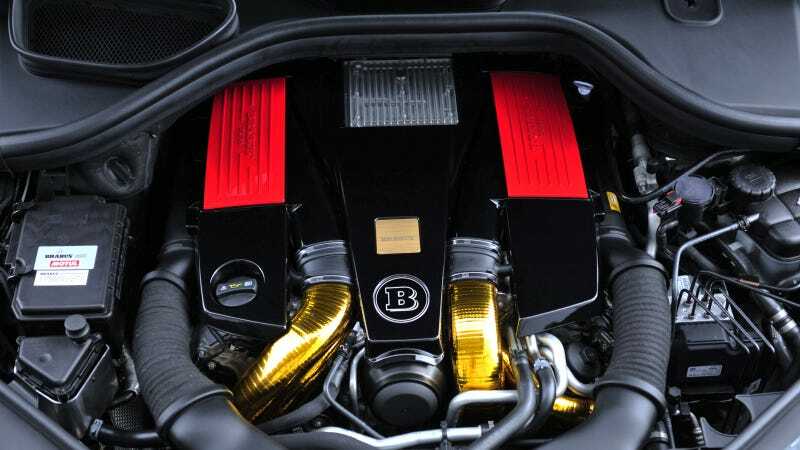 They include the two special BRABUS turbochargers with larger compressor unit, which generate a higher boost pressure than the production turbos. The production exhaust system is replaced with a free-flow metal catalyst system that features downpipes with a diameter of 75 mm (3 in.). In addition, a BRABUS stainless-steel sport exhaust system with controlled butterfly valve is available for both vehicles. They give the driver the option of choosing between a discrete "Coming Home" mode and a decidedly sporty exhaust note at the push of a button on the steering wheel. With a power output of 515 kW / 700 hp (690 bhp) at 5,300 rpm the BRABUS B63S - 700 engine in the ML 63 surpasses its origin by up to 129 kW / 175 hp (173 bhp) - depending on whether the car was delivered with or without Performance package. The GL 63 with an identical power output of 515 kW / 700 hp (690 bhp) adds 105 kW / 143 hp (141 hp). Just as impressive in both SUVs is the increase in peak torque. Both tuning versions produce 960 Nm (708 lb-ft) of torque from a low 2,000 rpm. Peak torque was limited electronically to protect the drivetrain. The combination of ultra-powerful BRABUS B63S - 700 engine and AMG SPEEDSHIFT PLUS 7G-TRONIC transmission achieves performance levels that previously seemed more likely for a sports car than for an SUV. From rest the all-wheel-drive car based on the ML 63 accelerates to 100 km/h (62 mph) in just 4.4 seconds. At 4.6 seconds the heavier GL takes just two tenths of a second longer. The BRABUS Vmax unit, which is part of the engine conversion, limits the top speed electronically to 300 km/h (186 mph) to protect the tires. Wheels in size 10Jx22 for the BRABUS WIDESTAR version are available in five designs: Monoblock VI, E, G "Platinum Edition", Q and R. The most exclusive version on offer features giant BRABUS Monoblock R "Platinum Edition" forged wheels in size 11Jx23. Thanks to state-of-the-art manufacturing technology these wheels represent a unique combination of lightweight construction and maximum strength. The matching high-performance tires in size 315/25 ZR 23 for the ML and in size 305/30 ZR 23 for the GL are supplied by BRABUS technology partners Continental, Pirelli and YOKOHAMA.